Discover the beauty of Diamond Ridge, a pet-friendly apartment community in North Richland Hills, TX. Providing residents with exceptional features and amenities, this community offers comfort and convenience for people of all ages. Gazebo – Enjoy a beautiful afternoon in the midst of the garden community thanks to the tranquil gazebo. Clubhouse – Hang out with other residents in the elegant clubhouse, which leads to the fitness center, shaded deck and game room. Deck – Spend the afternoon on the expansive deck, which overlooks the community’s resort-style pool. Leasing Center – Stop by the Diamond Ridge leasing center for a tour of this pet-friendly community. Exterior – Located off Loop 820, this garden-style community offers a peaceful living experience in the heart of DFW. Pool – Soak up the sun while lounging around the resort-style pool with a heated spa. Billiards room – Enjoy a game of pool in the resident clubhouse’s billiards room. Gym – Break a sweat in the fitness center, stocked with popular cardio machines and strength-training equipment. 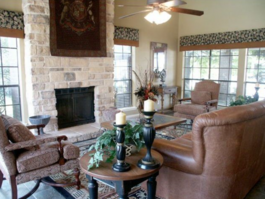 Living room – Create an inviting atmosphere in the living room with a stone-surround fireplace and soft carpeting. Bathroom – Pamper yourself in a deluxe bathroom with a ceramic tile shower and a well-lit vanity. Kitchen – Along with pass-through bars, these efficient kitchens include stainless steel appliances and natural wood cabinetry. For details on these one and two bedroom apartments in North Richland Hills, speak with a friendly staff member from Diamond Ridge.